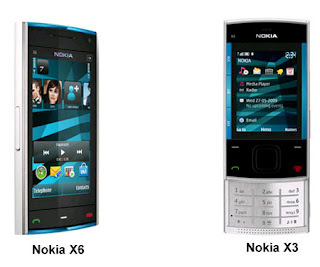 During this, the powerful Nokia handsets for the music business is always identical to the XpressMusic range. But it seems to be a slight change. Nokia launches Nokia X6 and Nokia X3, which is the range of the latest series. X6 is known as a powerful entertainment device. Equipped with a 32GB internal memory and 3.2 inch touch screen. With the format "wide screen" with a 16:9 aspect ratio. For music, the battery Nokia X6 can survive 35 hours nonstop, of course, in the offline conditions, and standby time up to 16 days. Nokia X6 has a 5 megapixel camera with Carl Zeiss lens and dual LED flash, TV-Out, N-Gage, and A-GPS with Maps Ovi. Or slide the slider version of Nokia X6 comes in the Nokia X3, which features 3.2-megapixel camera, FM radio, and stereo speakers. Another difference with the X6 is the software that still uses Series 40. Nokia X3 also a Series 40 device with the first that can access the Ovi Store. Nokia X3 screen smaller than X6, only 2.2 inches, and the media rely on a MicroSD storage card that has now reached the 16GB capacity. Nokia X3 can play radio without a headset. Price Nokia X3 around 115 EURO or about USD 1.8 million, while the X6 around 450EURO or USD 7.5 million. All will attend the end of 2009.